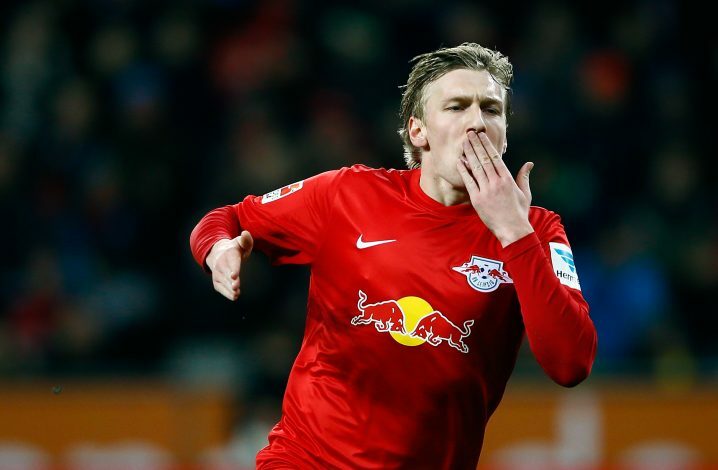 RB Leipzig’s Emil Forsberg has insisted that he is happy at the German club and has no plans to leave this summer, despite huge interest from Manchester United. The Swedish international emerged as a potential transfer target for Jose Mourinho after United failed to agree a fee with Inter Milan for Ivan Perisic. However, following reports linking the 25-year-old to the Mancunian club, Forsberg broke his silence for the first time. “I only answered a question from a journalist and my answer was that Bayern Munich are one of the biggest clubs such as Real, Barca and Manchester,” the talented wide-man told Kicker. It is no surprise that the Red Devils are interested in acquiring the services of the midfielder. After all, he was one of the key performers for Leipzig last season, which saw them exceed all expectations before they finished second, only behind Bayern Munich. The former Malmo man scored 8 goals and assisted another 19 in the Bundesliga. Given the talent and the versatility that the midfielder is blessed with, he could prove to be a crucial signing for Mourinho’s side. He can play in various positions, and can effectively dictate the tempo of games. If United manage to land the Swede, it would surely spell a fruitful summer transfer window for them.